CAAnimation is the abstract class that all animations subclass. CAAnimation adopts the CAMediaTiming protocol which provides the simple duration, speed, and repeat count for an animation. 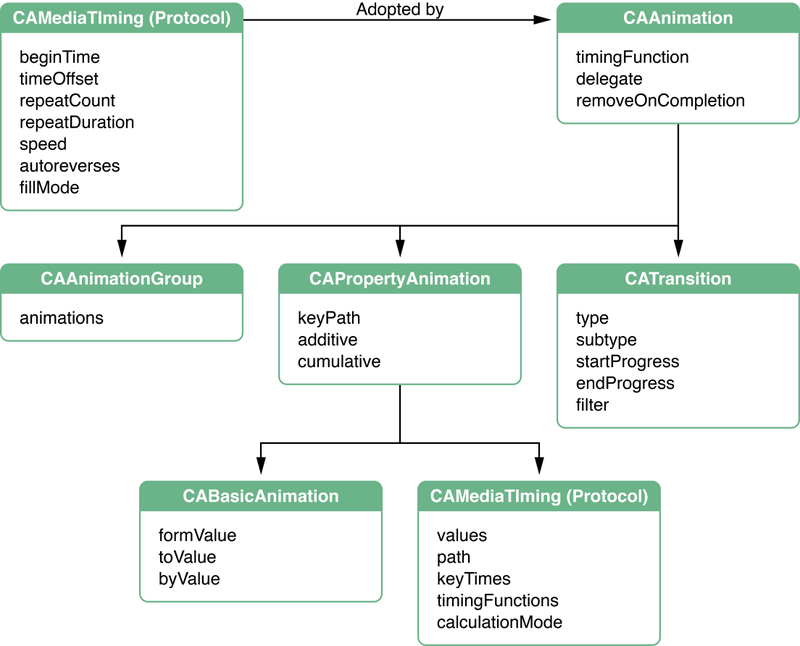 CAAnimation also adopts the CAAction protocol. This protocol provides a standardized means for starting an animation in response to an action triggered by a layer. The CAAnimation class also defines an animation’s timing as an instance of CAMediaTimingFunction. The timing function describes the pacing of the animation as a simple Bezier curve. A linear timing function specifies that the animation's pace is even across its duration, while an ease-in timing function causes an animation to speed up as it nears its duration. CAPropertyAnimation is an abstract subclass of CAAnimation that provides support for animating a layer property specified by a key path. CABasicAnimation is a subclass of CAPropertyAnimation that provides simple interpolation for a layer property. CAKeyframeAnimation (a subclass of CAPropertyAnimation) provides support for key frame animation. You specify the key path of the layer property to be animated, an array of values that represent the value at each stage of the animation, as well as arrays of key frame times and timing functions. As the animation runs, each value is set in turn using the specified interpolation. CATransition provides a transition effect that affects the entire layer's content. It fades, pushes, or reveals layer content when animating. On OS X, the stock transition effects can be extended by providing your own custom Core Image filters. CAAnimationGroup allows an array of animation objects to be grouped together and run concurrently. Figure 1 shows the animation class hierarchy, and also summarizes the properties available through inheritance.